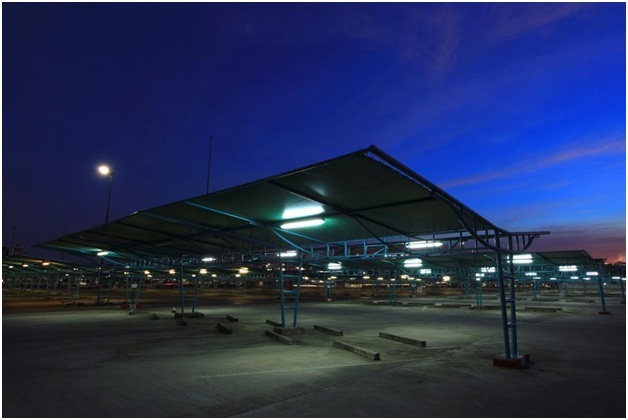 Parking lot lights refer to the lighting fixtures that are mounted on a parking structure’s ceiling or an overhang. Its purpose is to provide illumination for vehicles and pedestrians alike. They are available in different light intensities designs. Parking lot lights consist of three kinds of lamps. These include high intensity discharge (HID) lamps, high pressure sodium lamps, and mercury vapor lamps. High intensity discharge lamps consist of an electric arc that’s located between the tungsten electrodes. These are placed inside an alumina arc tube. The tube consists of a noble gas along with metal salts. High pressure sodium lamps also consist of an arc tube. It’s supported by a frame in the bulb. The tube consists of sodium, xenon, and mercury. It also consists of a built-in igniter, which sends a pulse of high energy through the tube. The pulse heats up the mercury and produces light. Mercury vapor lights are similar. The only difference is that they consist of vaporized mercury, which produces the light. All lighting fixtures have their fair share of problems. Let’s take a look at the common problems that property owners face with parking lights. 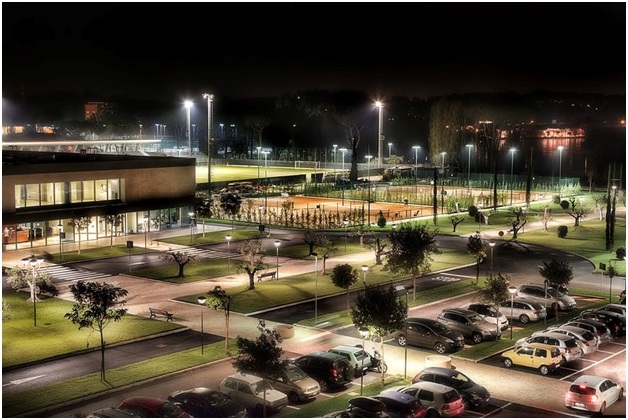 Parking lots consist of high intensity lights which consume more energy than other lighting options. Their consumption ranges between 100–1000 Watts. Furthermore, HID lights typically consume more energy than other lights. A 400W or 1000W HID fixture can cost around $209 to $525. Therefore, you need to consider factors like spacing, mounting, and the area that needs to be illuminated before installing the lighting fixture. Maintaining parking lights is also a major concern for property owners. For starters, parking lights, too, have a limited life. They need to be replaced every few months. The problem is that these lights are placed roughly at a height of 15 feet and in order to replace them, you’d need bucket trucks or lifts. Most property owners don’t own these trucks therefore they need to hire an external contractor for the replacement of the lights. This can be quite costly. In fact, you might end up spending as much as $1,200 in labor and material within a span of 3 years! Performance of the light depends on the kind of lighting fixture you have installed in your parking lot. For example, metal halide lamps are brighter than other fixtures but they consume more lumens because of which the output of the lamp decreases as time passes. High pressure sodium lights, on the other hand, consume less lumen. Therefore, they last longer. However, they’re not as bright. Do you need to get the lighting fixtures in your parking lot fixed? Get in touch with us. We offer electrician services in Cypress, Texas. We also offer generator repair services and you can contact us for the above at +1 832 948 6019 or visit our website for further information.